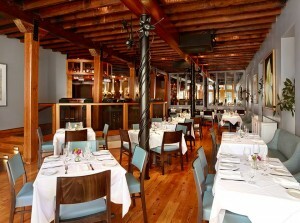 Magnolias is a mainstay of the culinary scene in downtown Charleston. 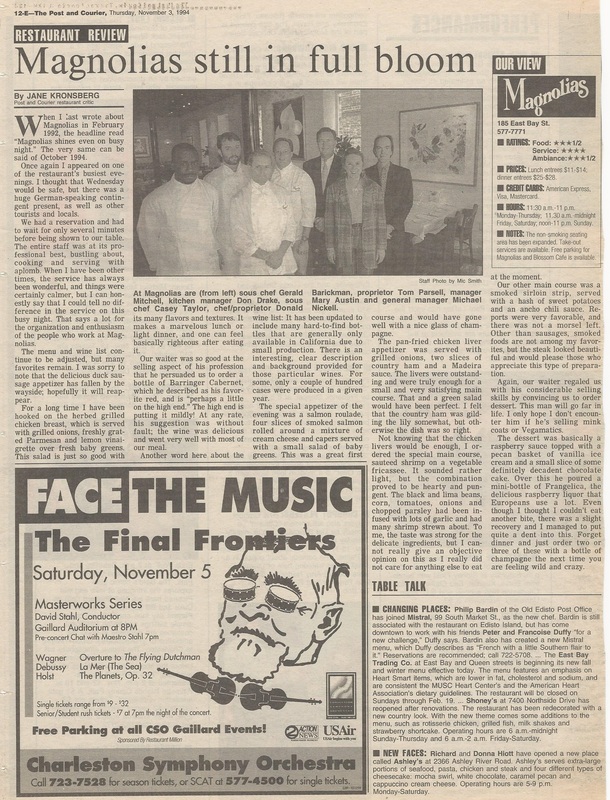 For more than two decades, the restaurant has held its place as one of the city’s most prestigious establishments thanks to its distinct approach to traditional southern fare, unique wine program and unparalleled service. 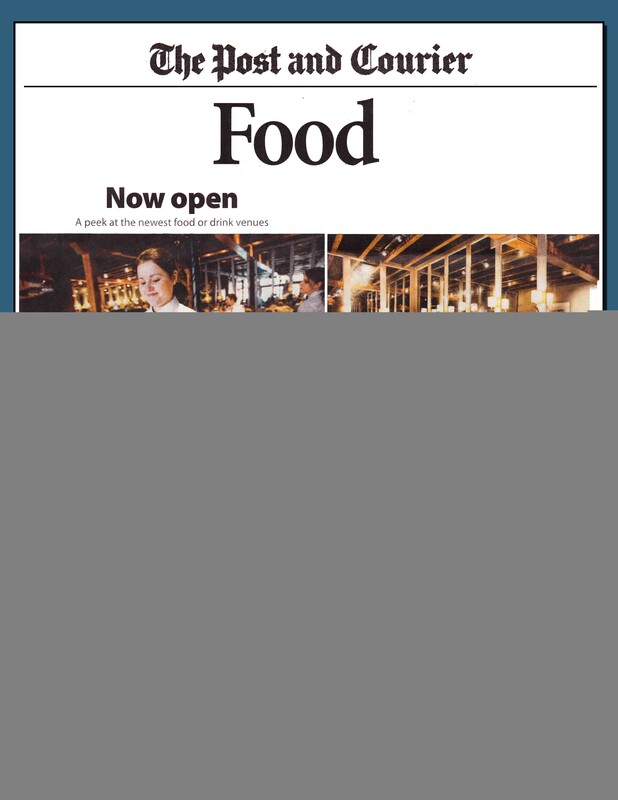 Critic Jane Kronsberg first reviewed Magnolias in 1992 and again two years later echoing the restaurant’s continued success, noting its progressive take on wine and steady stream of diners even midweek. When speaking recently with Chef Drake and TJ Parsell, owner and president of Hospitality Management Group, we asked them to provide their thoughts on what has changed, what remains the same, and what keeps guests coming back year after year. Parsell: As Magnolias approaches its 25th anniversary in 2015, guests continue to look to this staple for the original Southern charm they have come to know and love since it opened its doors. Magnolias’ continued excellence in providing diners timeless Lowcountry cuisine keeps visitors hungry to return. The consistency of Magnolias’ charming atmosphere and celebrated cuisine beckons locals and visitors in to this East Bay St. classic year after year. One of the most notable consitencies from the early reviews is that of Chef Don Drake. 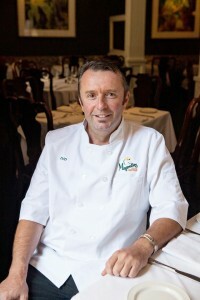 A rarity in the culinary industry, Chef Drake has been at the helm for all but 2 of the 24 years Magnolias has been open, keeping the restaurant true to its southern roots. Drake: My tenure at Magnolias is attributed to the Parsell Family. Tom & Suzie [Parsell] were great mentors—Suzie with her philanthropy and support of local events and Tom, sharing both his business and personal advice. He was like an older brother, and we had a lot of fun over the years (and he kept me out of trouble!). Now with TJ’s leadership, it seems like we haven’t missed a beat. We work well together and have great plans for the future. It would be really hard to work for another company—I think I’d just retire and go sailing. Parsell: In this business, it’s all about consistency and quality in food and service. Drake’s tenure at Magnolias has eliminated many of the problems restaurant face with turnover, especially in upper management. 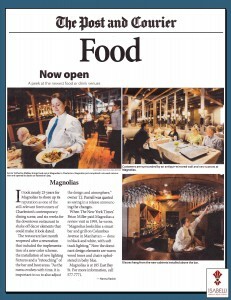 While consistency in staff, food and service have clearly served the establishment well, Magnolias recently underwent major renovations resulting in a new color palate and refreshed décor that underscores the restaurant’s prowess to endure.The reaction to the new space from diners and critics alike has been overwhelmingly positive. Parsell: As the menu evolves with time, it was important to us to also adjust the design and atmosphere, providing the best dining experience for our guests. The space has been updated with a sophisticated look, but guests will still feel like they are in their favorite spot for world-class Southern cuisine. Magnolias’ continued presence in the community has delivered a comforting and familiar dining experience for more than two decades, and we look forward to enjoying all that the restaurant has to offer for years to come. Kelly Franz, Chef de Cuisine, has been with the team for 11 years. The chicken livers, a guest favorite, have never been taken off the menu. 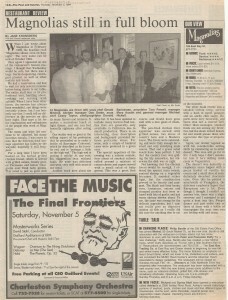 Two featured oil paintings and several lithographs from Ron Goebel’s Magnolias Suite, commissioned by Tom Parsell for the opening of Magnolias in 1990 still remain in the restaurant.